We often are asked why we aim for the center of mass, which is center of the chest, in defensive shooting and not at the legs to maim someone. The answer is two-fold. First, a very forgiving hit rate statistic for Law Enforcement is a 30% hit rate. Which means that the police, the professionals, are missing their targets 70% of the time. So what makes us think that we, even with diligent training, are going to do better? 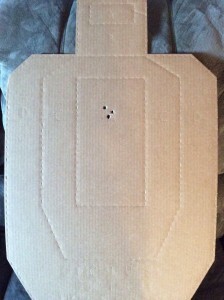 It’s hard enough to get your shots on target when you are moving and your target is not, but in a defensive situation, you are moving AND the perpetrator is moving. You must aim for the largest portion of their body to increase the probability of getting your hit on target. The largest portion of the human body is the Center of Mass, the chest. It just so happens, that in the chest, are vital organs necessary for life. When these organs are punctured, death will occur without immediate medical attention. When you are shooting in self-defense, you are shooting to stop the threat, not to kill the threat. Center of mass impaction will likely stop the threat but as a result, the threat also may die. Second, the only time that lethal force is EVER to be used is when you are in fear of your life. If you are indeed in fear of your life, you will not have time to aim at a limb to try to injure your perpetrator. If you find yourself before a jury of your peers after the shooting, you will have a very difficult time convincing them that you were indeed in fear of your life so you shot him in the leg. In self-defense, we are never shooting to kill a person but to stop a threat. Aim for the largest portion of the body to increase the chance of stopping your threat. Lethal force should only be used if you are truly in FEAR OF YOUR LIFE. I sighed with dismay and entered the store. I was approached immediately by the female worker who kindly asked if there was anything I needed. I told her I was looking for a bedroom set and looked around the store. When I found something I liked, I asked her who in management was responsible for the “no guns allowed” sign on the door. 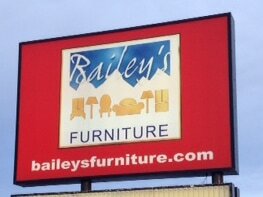 She told me it was company policy at all Baileys stores. I asked her how the public responds to the store’s request to disarm their law-abiding customers. She said “there have been some complaints, but not many.” She went on to say “it really is for our protection in the store since we have money here.” I stared at her in shock for a minute, does she really believe a sign on the door of the business will prevent a criminal from coming in with a firearm? For those of you who have trained with us, this is an example of walking in ‘WHITE’: oblivious, unaware and with a feeling of security and safety that isn’t real. I told her I was unable to give her my business because of “company policy” and left the store. So, did I commit a crime in Alaska by choosing to ignore the requests of the private business owner and carry my loaded firearm concealed into the store? Absolutely not! Any business owner can make such a request but it is not enforceable. What CAN be enforced is possible trespass when you are asked to leave and do not comply. 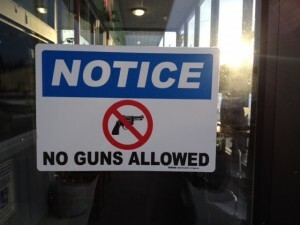 To repeat: IN ALASKA, YOU ARE NOT BREAKING ANY LAWS BY CARRYING YOUR FIREARM INTO A PRIVATE BUSINESS THAT HAS A ‘NO GUNS’ SIGN ON THEIR DOOR. However, if you are asked to leave the business you must do so or you may be charged with trespassing. This rule applies to our local banks and hospital as well. As a rule, I try to respect the requests of the business owners by staying off their property and taking my business elsewhere and I suggest you do the same. We need to let these business owners know that it’s NEVER a good idea to disarm the law-abiding citizens of this Great Country. Concealing a Firearm Under 21? “My 19 year old daughter took your class a while back and we were extremely happy with it. Tonight, while she was out jogging, I received this text from her.”Help! Creepy guy won’t leave.” My first thought was fear. My second thought was, “She has her gun and knows how to defend herself!” (She made sure I knew she had it before she left home.) My husband got in the car and was there picking her up within three minutes. She was fine, although a bit uneasy, and the “creepy guy” was still walking by her side. (He had come up jogging from behind, and when she stopped to walk, he did also, keeping pace with her) But my point is this- She could have defended herself, she was prepared, and we all knew she had her gun and your training. An affirmative defense is a justification for the defendant having committed the accused crime. Self-defense is actually an affirmative defense or justification for committing a crime. You are breaking the law to use lethal force for self-defense but you have justification for doing it. The same way, it is committing a crime for someone under 21 to conceal a firearm but there is justification for committing the crime. It is justified when one is participating in lawful hunting, fishing, trapping or other lawful outdoor activity that may involve carrying a weapon for personal protection. 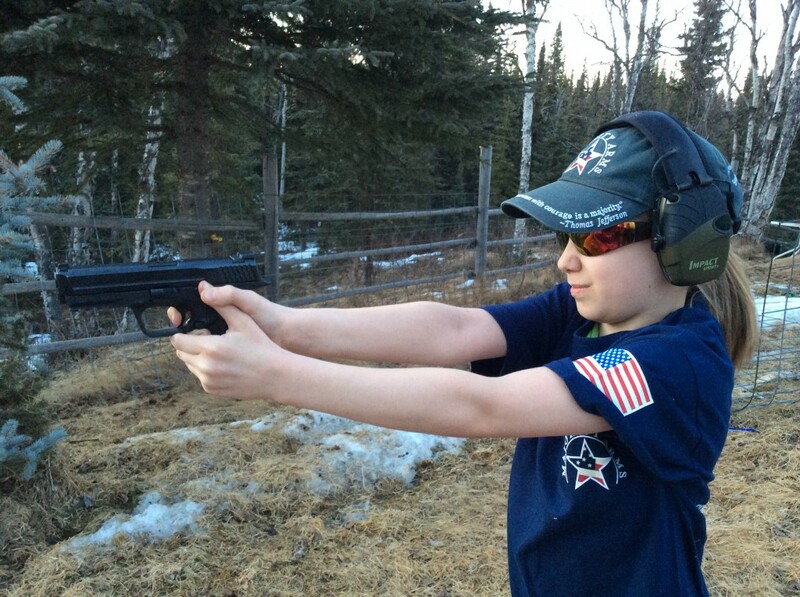 Do to the nature of Alaska, our firearm laws are actually very forgiving and you could almost make a case that ANY outdoor activity in Alaska involves carrying a gun for personal protection. In conclusion, it is a crime in Alaska for someone under 21 to conceal a firearm. However, the crime is justified if you are legally hunting, fishing, trapping or participating in any legal outdoor activity that may warrant a firearm for personal protection. I think jogging in Alaska is certainly a legal outdoor activity that involves a gun for personal protection. I NEVER exercise out of doors in Alaska without my firearm. With that being said, if you have not been properly trained to use your firearm under stress, carrying it with you only gives you a false sense of security. Firearm training can give you true PEACE OF MIND with a firearm and I don’t believe anyone should carry a firearm without it. Remember, even though a permit is not required to conceal in Alaska, if you choose to carry, you are responsible for knowing all the State laws about firearms.